When my youngest was small, she was completely mesmerized by marine life. She loved television shows, books, magazines, or just about anything that had to do with whales, dolphins, turtles, or other large sea animals. Curiously, she did not have a strong interest in sharks. In some ways, it was surprising to me since rarely, did I go through a store with a toy section without encountering a boy between the ages of three and eight that was not running down the aisle with a toy shark making it swim in midair and yelling “it’s a shark!” I asked her about sharks once and she told they were “mean and gross.” So, one night when there was nothing on television, I watched a program on sharks to see how mean and gross they really were. I had heard from several people that sharks have to keep swimming at all times or they will die. The program went into some detail about how a limited number of sharks have lost their ability of breathe by buccal pumping or pulling in water to glean the necessary oxygen. As a result, these sharks have to continuously move to ram water into their mouth or they will drown from a lack of oxygen. Out of 400 types of sharks, around 24 uses obligate ramming to breathe. The great white, mako, salmon, and whale shark all possess this necessity. Like these sharks that have to move to take in oxygen, an effective organization has to be continuously innovating. Basically, if we stop innovating, we are dead. It may not be a quick death, but as our competitors gain an advantage and reduce our market presence, the inevitable occurs: we cease to be relevant to the market and no longer exist. What do I mean by innovation? 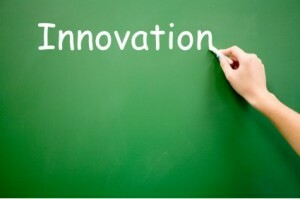 Innovation is the creation of new products, processes, or characteristics that increase the value of the organization. Innovation begins as an idea that becomes a reality through specific actions. When we think about innovative companies, who come to mind? Most of us would select firms that most impact our own lives: Apple, Facebook, or Google. Not surprisingly, when Fast Company ranked the 50 most innovative companies of 2011 the list included two primary types of companies: those that have innovations that changed our daily lives or those that have pushed the edges of our health, society, or community. The writers conclude that the companies possess three major things in common: desire to move beyond convention, willing to fail, and clear mission (see http://www.fastcompany.com/most-innovative-companies/2011/). There is another characteristic that most well managed, innovative companies possess: financial success. There is a recognizable correlation between successful innovation and business success. Research conducted by McKinsey found that strong innovators do consistently well by outperforming the markets they operate within more than entering new markets. In addition, the research demonstrated that innovators do better in an economic downturn when there is a commitment to innovation. Finally, it was noted that there is a “sweet spot” for the level of innovation where firms can manage and capitalize the new ideas and processes in order to take advantage of them instead of being over or under committed to innovating (http://whatmatters.mckinseydigital.com/innovation/innovation-what-s-your-score). What is desired by the marketplace? What can yield additional revenue or profit? Innovation just as research in general should begin with a structure or framework. The majority of effective innovators have an actual innovation methodology or system that organizes the innovation process. Creativity and freedom of thought in the conception phase is absolutely critical, but as the concept moves to implementation, more structure is needed to ensure that timelines are met, quality standards are preserved, and stakeholders are reached. How can I meet their needs? Just as innovation should be guided by the desires of the marketplace, it is important that the necessary analytical diligence occur to ensure that the commitment to producing an innovation will provide the types of returns desired by the organization. An effective organization must be able to accurately estimate the impact an innovation will have the marketplace as well as the firm’s bottom line. This is important from a return on investment standpoint, but is critical in assessing opportunity cost. When managing scare resources, it is important to make sure the innovation you select to mass produce is the best alternative. This entry was posted in Leadership, Organizations, Performance and tagged effectiveness, innovation, organizational effectiveness. Bookmark the permalink.